Considering the size and the logistics for staging Les Troyens, every new production of Berlioz’s epic masterpiece is a special event. 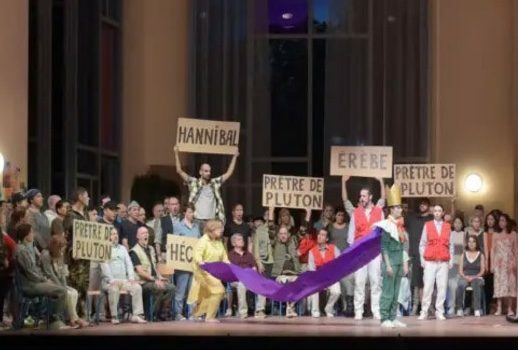 Therefore, a lot of excitement awaited a new mounting by Opéra Bastille, part of Opera de Paris’ 350 Anniversary celebration. Alas, things didn’t progress as planned on the way to the first performance. About one month before, Bryan Hymel and Elina Garanca withdrew as Énée and Didon, to be replaced by Brandon Jovanovich and Ekaterina Semenchuk respectively. To be honest, I was pretty disappointed with those cast changes, as I was looking forward to hearing both in those roles. Nevertheless, I marched on to see the second performance on 1/26. The evening started really well. Tcherniakov reimagined Troy to be some war-torn place in modern times, led by King Priam as their dictator leader. The set was a juxtaposition of King Priam’s throne room (placed on the right of the stage and brightly lit by beautiful crystal chandelier) to the dark empty buildings, part of them looked like being abandoned. In a way, it gave a foreboding vibe about the tragedy about to unfold. The area above the throne room was used for projections and supertitles. I like the introduction of each member of King Priam’s family at the beginning, done as the intro to a TV series with supertitles above. As they were all dressed in modern clothes, it was very helpful to identify each character. Tcherniakov set the main role of the Trojan Cassandre to be more than just a distraught Prophetess. 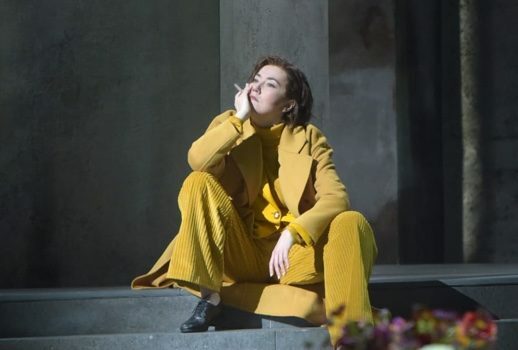 She was neurotic and rebellious, even overbearing, and mezzo-soprano Stéphanie d’Oustrac, decked in mustard yellow overcoat, fully embodied her in this fashion. I had my reservation regarding d’Oustrac initially when the cast was announced, but she fully exceeded my expectation that night. With dark bold voice and commanding presence, she truly captivated the audience’s attention. Interestingly, her entry aria “Malheureux roi!” was played as a TV interview, complete with cameras rolling! One downside of such extreme persona for Cassandre was that she didn’t seem to care for her betrothed Chorèbe. It was pity as Stéphane Degout, quite possibly foremost French baritone at the moment and Chorèbe veteran (he sang it in John Nelson’s recording few years ago), imbued the role with so much tenderness and care that in their duet I couldn’t help thinking Cassandre was bullying him. What really helped the performance, and the whole night, was the exemplary conducting of Philippe Jordan, led the orchestra in moving and exciting manner. There wasn’t any instance felt rushed or dragging. Equally impressive was the Choeurs de l’Opéra national de Paris, led by José Luis Basso, that not only commented on the whole proceeding throughout the evening, they also actively participated as important character of the night! Tcherniakov used the projection above the throne room to give backstories for the characters. While in itself this was a good idea, unfortunately some of the contents of those projections were rather half-baked, and eventually just distracted from the main story. For example, he seemed to suggest that King Priam abused Cassandre when she was a little girl (probably to justify why Cassandre was so hostile to King Priam). Even more damaging was when it showed the inner thoughts of Énée (who was very dismissive towards Priam), leading to that unfortunate scene in Act 2 where Énée was seen to actually make a pact with the Greek soldiers attacking Troy! I was very puzzled by that scene, as to me, a traitorous Énée would pretty much end the story right there! Another great idea with poor execution was the death of Cassandre in Act 2. Instead of stabbing herself, here Cassandre was shown as dousing her body with gasoline, and set it on fire. This would make a great spectacle, except for the fact that a couple moment prior to that scene, inexplicably there was somebody already set himself on fire walking on stage! Speaking about missed opportunity here! I did however think that the final scene, where the women defiantly resisted Greek army, was heartbreaking and very effectively staged. Personally, I always find the transition from Troy to Carthage very problematic, and it requires a very good dramaturg, particularly in the staging of arrival of Énée and the Troyens, to ensure the cohesiveness of the story. Tcherniakov’s setting of Carthage proved to be the biggest problem of the night. Instead of a kingdom in Africa, he placed it in a modern rehabilitation center. Not just any rehab, he specified it to be “War Victims” rehabilitation center, and to soften the blow, he actually opened the set during the (first) break. Back in Bastille, my mind was very hard to discern this reading, as it was totally nonsensical to me at that time. However, the following day after I thought it over, I kind of see Tcherniakov’s idea in setting it that way; the whole thing could be just in Énée’s head, or it could have happened where Énée ended up (considering the whole opera was now set in present time). Subsequently, Didon was no longer the Queen of Carthage; instead she was one of occupants of the rehab center that happened to be the “queen” of the day, as she was “anointed” with paper crown and a piece of cloth. In my opinion, the relegation of Didon to just a common woman made it hard for the audience to sympathize with her plight and tragic demise. After all, if she was nobody, why should we care? That was unfortunate, as Semenchuk really gave her all to the role. Always a consummate actress, she expressed the many facets of Didon with her voice, from exuberant and lovelorn to eventually anger and resignation in the last act. As Énée, Jovanovich, too, was fully committed to the demands of the role. A Énée veteran (he sang the role in Wiener Staatsoper barely 3 months prior), he employed his bright tenor voice heroically and smartly, although he did sound a bit tired by the crucial last act. It didn’t help that Tcherniakov demanded that he fought the Numibian king (now resembled an intruder to the rehab center) at the end of Act 3 a la Bruce Willis in Die Hard movies, in elaborate fighting scenes that Jovanovich performed valiantly, including being kicked and slapped! He even body-slammed that king for victory! The relationship between Didon and Énée, also, became questionable in Tcherniakov’s vision. Who could answer that they really cared for each other, especially after the love duet in Act 4 was sung with them being in separate tables in that rehab center, barely even looked at each other? But again, if they didn’t care for each other, then why did his departure affect her so much? The death of Didon was a total puzzlement to me; after being overdosed with pills, she was shown to appoint another to be the next “king” and eventually, stabbed him with a paper sword as she fell to the ground. I still tried to figure out what that symbolized. The supporting cast was uniformly excellent vocally. Anna and Narbal, now became therapists in that rehab center, boldly sang by Aude Extrémo and Christian Van Horn respectively, and they have great chemistry as a duo. They were pretty athletic as well, as their long duet concerning Didon’s love at Act 4 was sung over a game of ping pong! (That night, Extrémo won.) In addition, Cyrille Dubois’ Iopas was particularly memorable, as he serenaded Didon and the rest of the occupants doing yoga with “O blonde Cérès” in his bright, sweet and soothing voice. In summary, it was a night full of gorgeous singing, glorious conducting, and a staging that left me with more questions than answers. On that night (1/28, the second performance), after we came back from the second intermission, chaos erupted in the audience, as people started shouting and booing from all directions, and others tried to counter them to shut them up. It got louder and so bad that eventually Jordan had to raise white flag with his baton to completely drown the audience so that he could start. It was so surreal; I had never seen anything that bad before. And that, my friend, was totally worth the price of admission!